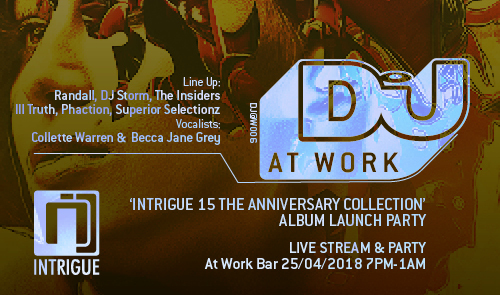 DJ Mag at Work presents d&b label and party extraordinaires Intrigue as they celebrate their 15th birthday, featuring veteran junglists Dj Randall & DJ Storm, plus Intrigue selectas The Insiders, Phaction, Ill Truth & Superior Selectionz. With vocalists on the night Collette Warren & Becca Jane Grey. Come down and hang with the Intrigue crew, hear some killer d&b and grab a copy of the very special ‘Intrigue 15: The Anniversary Collection’. This event will also be streamed live through social media channels on the night! A brand new album to celebrate fifteen years of the Intrigue drum & bass night, featuring fifteen exclusive soul-infused tracks from new stars and established names alike. The series has grown by a track a year since its inception five years ago, and ‘Intrigue 15’ is without doubt the biggest yet.